It should be noted that the exponent can vary between 1.6 to 2.0. In this illustration, we have shown an exponent of 2 for simplicity. A simple procedure for calculating emittance may be found in the Standard for Measuring and Compensating for Emittance Using Infrared Imaging Radiometers. To order a copy of this or other standards, call Infraspection Institute at 609-239-4788 or visit the Infraspection Online Store. Flame Resistant Clothing is required Personal Protective Equipment for many who work in high temperature areas or near energized electrical equipment. If your job requires the use of FRC, there are several important things of which you should be aware. FRC is manufactured with different materials and different weights. Be certain that the chosen material is appropriate for the task at hand. FRC effectiveness can be compromised by age, wear, contamination with flammable materials and the attachment of name patches or embroidery. FRC can be permanently damaged by improper cleaning or laundering. FRC provides protection from thermal burns. It does not provide protection against other hazardous forces such as flying debris, electric shock, or the supersonic blast wave that may be associated with arc flash incidents.FRC is only effective when it is worn properly. It should always be worn as the outer-most garment. If worn over other layers clothing, the undergarments should be made of natural fiber and completely covered by the FRC. Performed in conjunction with regular visual inspections of your roof, infrared inspections of low slope roofs are a very cost effective way of tracking the overall health of your facility’s roofing system. Locating leaking areas while they are small allows them to be addressed before they can spread. Additionally, moisture trapped within a roofing system almost never dries out and can cause premature failure of the roofing membrane, adhesives, fasteners, and the roof deck. Whether you choose to have an in-house thermography team or an outside contractor perform the inspection, make certain that the Thermographer is both Certified and experienced. Since an infrared imager cannot confirm moisture presence, all infrared data must be verified by invasive testing as well. Infrared inspection of flat roofs is one of the many topics covered in the Infraspection Institute Level I Certified Infrared Thermographer® training course. For more information or to register for a course, visit Infraspection Institute or call us at 609-239-4788. With parts of the US experiencing record setting heat, it is hard to think about winter. For many, autumn provides a perfect opportunity to conduct infrared inspections of flat roofs to help ensure that they are ready for the upcoming colder months. Ever since Google became the number one search engine, companies and individuals have been trying to get them to recognize their website. So the experts have been giving website owners advice on how to accomplish this task for a few years. Unfortunately, the advice they are giving has not kept pace with the way Google decides if a website should be included in the search results, on what page of the search results it should appear, or, if the website should be ignored. Here are a few tactics that have lost the favor they once held by Google and other search engines: links to your website, what comments you make about your website on blogs or forums, keywords. Whoa! Keywords? They aren’t relevant? This correct. In fact, they haven’t been relevant for a number of years. By keywords we mean the words that are entered into the keywords metatag in the code that displays your website. The keyword metatag is passé. Now don’t go running off to delete all your keyword metatags; some search engines still look at them, just not Google. So, here’s what does work with Google. 1. The URL of the webpage. If you can, it is helpful if the url of the webpage is closely related to the topic of the webpage. If the page is about cats, a good url would be www.domain.com/cats.html. 2. The Title metatag. In the codebehind your webpage, there is a place for you to give a Title to the page. Do this. Don’t overlook it. This is part of what Google will display if your website appears in the Search Engine Result Pages (SERPS). A good Title metatag would be “This webpage is about the history of cats.” Try to keep your Title metatag no more than 70 characters including spaces. 3. The Description metatag. This is also a most important metatag. What you write here will appear in the description of your webpage if Google decides to show your page in the SERPS. Here is a clear Description metatag: “The history of cats is amazing and you will want to read this with your cat.” About 150 characters including spaces; more characters and Google will display an ellipsis (…) instead of what you wrote. The best place for an H1 tag is in a headline, larger font, above a paragraph of text. Think of them as headlines. 5. Content on the page. This is the most important element for having your webpage in the Google search engine. The entire webpage should be on a single topic. Start adding more topics and Google has difficulty determining what the webpage is about. The content of the webpage should use words that clearly express what the webpage is about. Sound familiar? This is the current definition of KeyWords. Some good keywords for our example might be “cat”, “feline”, “history of cats”, “history of short hair cats”. However, do not overuse the keyword that you want Google to take notice of. Use the word too many times and Google will call it “keyword stuffing” and your page will be penalized. More than seven uses of a word begins to move into the “keyword stuffing” area. The above tips are not all inclusive of what Google calls “signals” for a webpage. However, they are among the most relevant. Following the guidelines above will not guarantee you will be in the Google results but if you aren’t using them your success rate will be greatly diminished. With awareness of infrared technology at an all time high, point radiometers have become a common tool in many areas. Frequently, knowledge of proper operation lags behind instrument popularity. Understanding how spot measurement size affects accuracy is imperative to collecting meaningful data. Point radiometers are usually supplied with a Distance to Spot Ratio value. To determine spot size, divide distance to target by ratio value. Point radiometers have minimum focus distances. At lesser distances, spot size will not decrease. When using a point radiometer, be sure to understand the limits of your instrument and the challenges presented by your target. Always use correct emissivity values and stay within the limits of your instrument. Spot measurement size and its effect on non-contact temperature measurement is just one of the many topics covered in all Infraspection Institute Level II Certified Infrared Thermographer® training courses. For more information on open enrollment classes or our Distance Learning opportunities, call 609-239-4788 or visit us online at www.infraspection.com. For many facilities, obtaining accurate product level information for tanks and silos is critical for effective inventory management and safety. Under the right conditions, a thermal imager can quickly indicate product levels and serve as a cross reference for calibrating level indicators. When product is stored in a vessel, the density of the product is usually greater than the head space of air or gas above the stored product. For stored products that generate heat, levels may be observed by imaging the vessel’s exterior and noting the temperature gradient between head space and product. For stored products that do not generate heat, it is possible to rely on solar loading to create a temperature differential. Under solar loading conditions, vessels will usually exhibit cooler temperatures above the product level during the early to mid-morning hours. As the day progresses, the head space will exceed product temperature and show as a warm area above the product. This thermal pattern may remain for up to several hours after sunset and reverses once the head space cools to below stored product temperature. In general, this application works best for un-insulated, single-wall vessels having a high emittance. For vessels with a low emittance, it may be possible to modify the surface with a stripe of high emittance paint. This application also works best on storage vessels where product level is not subject to rapid changes. 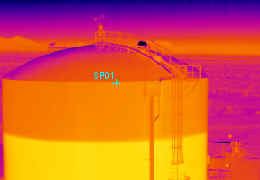 Thermal imaging of storage tanks and silos is one of the many applications covered in the Level I Certified Infrared Thermographer® training course. For more information on open enrollment classes or our convenient, web-based Distance Learning program, call 609-239-4788 or visit us online at: www.infraspection.com. With an unusually harsh winter well underway, many have already experienced driving challenges associated with severe weather. With this Tip, we offer some advice for driving in winter conditions.